Ellen DeGeneres and Portia de Rossi are getting married in June, it has been claimed. Ellen was allegedly confronted by Portia about their future plans after Ellen had finished hosting the Oscars. Former 'Ally McBeal' star Portia is said to have quizzed her long-term partner about her marriage intentions and forced her to set a date. 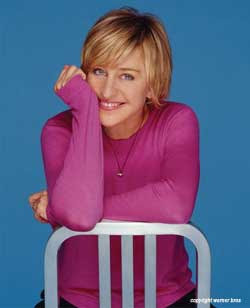 A source told the National Enquirer magazine: "Portia demanded that Ellen marry her. After lots of talk and plenty of hints, Portia finally confronted Ellen right after the Oscars about making a commitment." The couple are now planning a lavish ceremony for friends and family at their California home in June, when Ellen's chat show is off air. The source added: "Ellen's hiatus starts at the end of May, and her show doesn't start up again until August. "Ellen is very happy too. All her dreams are coming true."